Surmounting the north wall of the Little Yosemite Valley—the “ante-chambre” through which the Merced River approaches the Yosemite Valley proper—is a rounded eminence of bare granite, a typical dome of the kind so common in the central Sierra Nevada. Fully 2000 feet high above the floor of the Little Yosemite, it rises to an elevation of 8012 feet, to within a hundred feet, in other words, of the level of Sentinel Dome, the favorite panoramic view point of the tourist; yet it is an inconspicuous feature in the landscape, a mere wave in the billowy highland that stretches on either side of the valley trough. The towering bulk of the Clouds Rest massif, about a mile to the northward, further dwarfs it into insignificance; and thus, being remarkable neither for height nor for scenic assets, this unobtrusive little dome has remained generally unnoticed and unknown. Indeed, until quite recently, it did not even possess a name. Yet, to him who sees and knows, it is a place of peculiar if not unique interest, well worthy of a pilgrimage. There are other qualities besides spectacular height and scenic charm that attract one to some spots. 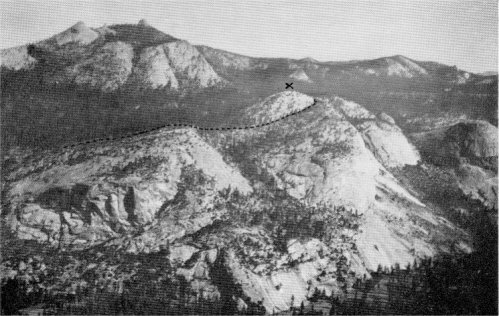 It was in 1906, at the time when the topographic survey of the Yosemite Valley was in full swing, that a party of surveyors one hot summer day approached this height, intending to make an instrument station on the summit. Keen to select an easy route for the ascent with their heavy plane-table outfit, they resolved to take advantage of what appeared to be a massive, tree-grown embankment that wound in a long smooth curve up the bulging south side of the dome (see photos on pages 66 and 67). 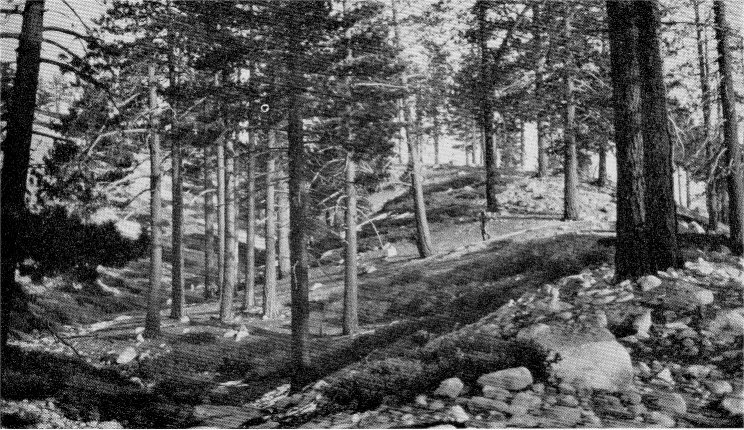 Some 40 feet high, it rose with steady, uninterrupted grade, as if laid by a careful engineer, carrying its strip of forest with it across the bare, sun-baked granite slope; and thus, by easy stages and under genial shade, the party reached a point less than a hundred and fifty feet below the summit. There the ridge came abruptly to an end, cut off by a precipice that fell off sheer almost 2000 feet to the valley floor below. Berkeley, Calif. Washington, D. C.
I am sending you by registered mail the manuscript of a paper on Moraine Dome which I had prepared for the Sierra Club Bulletin. (Through various delays it could not be finished in time to be included in the January issue, but I shall reserve it for the next one). I believe you may like to read it over, as it deals with the question of multiple glaciations in the Sierra Nevada. The Moraine Dome locality is of special interest in that it shows with considerable clearness the contrast in the age of the older and younger moraines. In fact, it was on Moraine Dome that the conviction first grew upon me that there are two distinct moraine series in the Sierra Nevada, recording two glacial episodes separated from each other by a long interval of time. The story of Moraine Dome, as told, is not really complete, as I intended it to be “popular” and as nearly free from complications as possible. It does not, however, omit any important facts. Reference might have been made to the older moraines shown on the map, which are so dim as to be unrecognizable as topographic features and can be traced only as belts containing Cathedral granite and other rock material foreign to the Yosemite neighborhood. Perched erratics occur on the Quarter Domes which lie just under the upper limit reached by the earlier ice. These domes show residual masses of granite decaying in place some five feet high. Dr. [Grove Karl] Gilbert is familiar With Moraine Dome and has visited it twice. The photo of the aplite wall was taken by him. Evidently his conclusions agree with mine, to judge from the notes appended to his photos in the Survey collection. Neither of us, however, knew that the other had visited Moraine Dome until I showed him my views (in 1906 it was, I believe). I should greatly appreciate criticism from you. most of the low mountains along the sky line. the boulders and cobbles protruding from its surface, many of them rounded and polished, and some representing rock types foreign to the Yosemite neighborhood, at once established its identity. Moraines are plentiful about the Yosemite Valley and its branches, but none had been observed so remarkably clean cut and perfect, nor had any been found in so striking a position, wreathed, as it were, about a dome. And so, quite naturally, the appropriateness suggested itself of naming the eminence for the embankment—and then and there the height was christened Moraine Dome. A full appreciation of the significance of the embankment, however, was not gained until afterwards. As the locality became better known in the course of the survey, the fact developed that the embankment on the side of the dome is the highest and largest of a series of parallel moraines. Spaced at intervals of a few hundred feet across the rounding granite slope below the great embankment are a number of such glacial deposits, all describing sympathetic arcs, all slanting westward at approximately the same rate. Each evidently records a halt in the subsidence of the ice flood, or a transitory rise of its lowering surface; together they tell the story of the progressively diminishing pulsations of the glacier during its decline. Some consist of little more than a mere row of boulders from among which the finer material has washed away; they bespeak fluctuations of ephemeral briefness. Others have the form of massive ridges, ten to fifteen feet high and supporting dense growths of manzanita and occasional pines; these attest rises of relatively long duration. Looking up the crest of the winding embankment. The summit of Moraine Dome lies to the left. this embankment is followed westward to the base of the dome, it is found to divide into two discrete moraine bodies which thence accompany each other as sister ridges 200 to 300 feet apart. Still farther west, upon entering the great embayment in the north side of the Little Yosemite Valley, each of these two ridges again is found to split into three separate sharp crests. What on the dome, therefore, would be taken for a single, compact, heavy moraine, proves in reality to be a composite mass, containing the proceeds of six separate glacier fluctuations. appreciable distance from its fellows. Particularly complete and detailed, for this reason, is the morainal record in the great embayment on the north side, as the traveler on the Sunrise Trail may conveniently observe. That route, in the first 1000 feet of its ascent from the floor of the Little Yosemite Valley, traverses 30 moraines in succession. Let us now see whether it is possible to trace the course of the upper embankment eastward from the dome. As was stated, the embankment terminates at a point about 150 feet below the summit. It stops there, however, not because the glacier was deficient in rock debris east of this point, but because the precipitous character of the cliffs here does not permit the lodgment of loose debris. It may reasonably be anticipated, therefore, that farther east, on more favorable ground, the moraine will be found to resume its course. And, so, indeed, it does; only, one must not look for any plain sailing in a search of this kind. The windings of a moraine are in considerable measure conditioned by the features of the landscape, and, in a locality of peculiar configuration such as this, are likely to be devious and elusive, like the turns and twists in a rabbit’s track. Moraine Dome, it will be observed on the map, does not curve down symmetrically in all directions. Northeastward it is prolonged in a nearly level, round-backed ridge, half a mile long and only some 60 feet lower than the summit. At its farther extremity this ridge carries a knoll of about the same height as the dome. Somewhere on this ridge, to judge from the slant of the embankment on the dome, the upper moraines may be expected to be found again. Starting out in search along the back bone, however, one is disappointed to find it bare and smooth like the dome itself. Even the lowest sag, which would naturally seem to hold most promise, is utterly devoid of debris. But on the terminal knoll, in the place where one would least expect to find them, there the moraines turn up again. At first they impress one as a confused jumble of boulder heaps, partly overgrown with brush; but a little study shows them to consist of several distinct bands, looped over the summit at intervals and trailing down to the southwest and to the northwest at a strong angle with the slope. On the south side of the knoll the loops are cut off short by the same great cliff that interrupts the embankment on the dome, but on the north side they can be traced down all the way to Sunrise Creek, across the Sunrise Trail and up again through a long arc to the south base of Clouds Rest. On the ground the significance of this arc is not readily apparent, as the forest growth precludes a comprehensive view; but when seen in its entirety on the map the arc is at once recognized as the outline of a short lobe of the Merced Glacier. That ice stream, it would appear, split upon the knoll and sent a small portion of its mass through the saddle to the north. How near the glacier came to overtopping the height is attested by the looped position of the moraines. The most advanced of the series even lies a little west of the highest point of the knoll. One wonders that the ice, having come this far, did not engulf the low ridge before it and advance to Moraine Dome; but its viscosity evidently did not permit this. Moraine Dome, together with the ridge extending northeastward from it, is, then, of special interest as a landmark demarcating what appears to be the highest level reached by the ice in the Little Yosemite Valley. Should anyone doubt the correctness of this interpretation, let him pursue the moraines described farther east. He will find them running along the north side of the valley as far as Sunrise Mountain, in the form of a great series of massive, parallel embankments. The Sunrise Trail for a considerable distance takes advantage of the mile-long, uninterrupted stretches of good going which these embankments afford and at last surmounts the highest of the series. No one, not even the most casual of observers can help noticing the uppermost moraine as he crosses it. Like an artificial battlement it looms, crowned with gigantic granite boulders that produce a white line through the forest visible from afar (photo, page 65). Below it are tiers of successively lower crests, all rock studded, and imparting to the mountain side a chaotic, wild appearance. Above, on the other hand, the slope is relatively smooth and featureless, smothered for the most part under a heavy mantle of disintegrated granite sand. So striking is the contrast, indeed, so conspicuous is the boundary between the moraine littered slope below and the smooth slope above that no one fully cognizant of its significance but will unhesitatingly declare: This line marks the highest level of the ice flood. Above it the glacier never rose. And yet again, it is well not to be too positive about these matters. On continuing the ascent of Moraine Dome from the upper end of the embankment, what does one find? 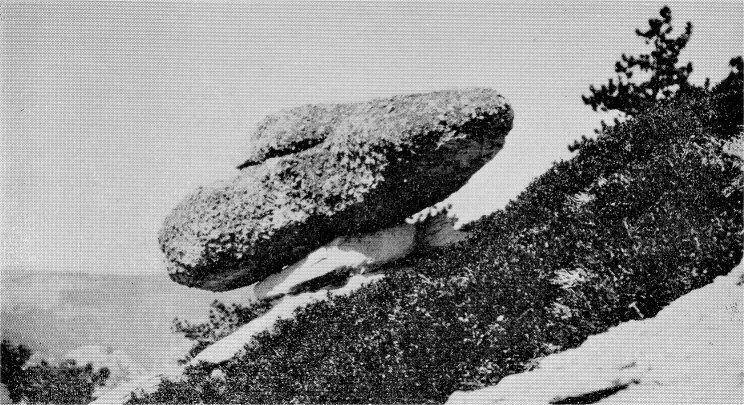 About 30 feet below the summit, on the south side, is an elongated boulder measuring 12 by 6 by 5 feet, perched on a pedestal some three feet high (photo, page 70). The pedestal is made up of remnants of inclined shells clearly belonging to the dome (surface shells of this kind, it may be explained in passing, are now recognized to be a normal feature of the Sierra domes), but the great capping boulder consists of a material differing conspicously from the local rock. Moraine Dome is composed of a fairly even-textured granite of creamy color speckled with dark mineral (Half Dome granite it is called by geologists, as Half Dome consists of this rock), while the perched boulder is of a pinkish granite with swarms of large, square-cornered feldspar crystals of a paler hue. More resistant to weathering than the matrix between them, these crystals stand out on the surface in high relief, like so many domino blocks, two to three inches long, lending the rock a perculiar, lumpy aspect. Nowhere in the Yosemite region is this type of granite found “in place”; but higher up in the Sierra Nevada it constitutes the prevailing country rock over large areas, notably in the upper Tuolumne basin. The rugged chain which terminates in Cathedral Peak is largely composed of it, and, accordingly, the rock has been named Cathedral granite. The nearest locality from which the boulder could have been derived is Long Meadow, which lies back of Sunrise Mountain, some five miles to the northeast. Clearly there is but one agent that could have brought it from that place, and that is a glacier. The very size of the boulder precludes the possibility of its having been transported by another agent. Besides, it is known that the Merced Glacier carried considerable of this material, fragments being plentiful in all of the moraines described. The glacial origin of the boulder being admitted, the conclusion previously reached that the great embankment on the flank of the dome marks the highest level reached by the ice, must be revised. Evidently the glacier did rise higher once. But, it may be objected, is this one boulder the sole evidence available of a higher ice stage? Granted that it is a sure-enough “erratic,” one would feel better satisfied, were there additional testimony of some sort. Such testimony indeed is found in the presence of another boulder of Cathedral granite, located on the very summit of the dome. Its position is such as to suggest that the entire dome may once have been overridden by the ice, and that, in order to determine the highest level attained by the glacier, the search may have to be carried to higher ground. This, it should be said, has actually been done, with the result that the ice is now definitely known to have overtopped the dome by five hundred feet at least. In the meanwhile the entire story of Moraine Dome is not told. In the first place, there is a certain significance in the almost complete isolation of the two erratics mentioned. Search as one may, there is not another rock of extraneous origin to be found on the dome. Yet the summit is broad and level, affording ample space for a heavy glacial deposit. If moraines are able to maintain themselves in the form of strong embankments on the steeply inclined flanks of the dome, why should there be such a paucity of glacial material on the much more favorable, level summit? The suspicion here insinuates itself that possibly one has to do here with the vestiges of what may once have been a moraine of considerable volume,— a moraine, however, of a very much earlier ice flood than the one whose history is so fully recorded in the heavy embankments lower down, a moraine so ancient, indeed, that all of its material has by this time disintegrated and washed away, save for these two solitary erratics. Several things seem to strengthen this suspicion. For one thing, both rocks have long since lost their ice-smoothed, rounded contour, and have weathered down to irregular, lumpy forms. Again, both rocks have pedestals. That the smaller one on the summit possesses such a support, has not been mentioned. The fact is that it no longer occupies its pedestal, but leans against the base, having slipped down apparently not long ago. That the little pile, which stands about twelve inches high, really once did serve as a support for the erratic, however, is beyond question; the badly decomposed granite of the pedestal clearly could not have survived above the general surface of the dome, save through the presence of a protecting cover of some sort. Indeed, there is no doubt but what the pedestals of both boulders owe their preservation to the protective influence of the resistant cap rocks. They have remained standing while the surrounding parts of the dome have gradually wasted away under the attacks of the elements. They point, therefore, to a general denudation of the dome that has been in progress for a considerable lapse of time. The exact rate at which the surface of a granite dome is annually lowered is, of course, not definitely known, but it is safe to say that the period involved was a lengthy one, to be reckoned in thousands of years. Perched erratics, it is to be noted, are by no means a common feature of the Yosemite region. Below the great morainal embankment that was thought to mark the culmination of the ice tide, perched boulders are signally absent. Detached erratics abound between the moraine ridges, it is true, but invariably they are found resting on the hard, smooth surface of the granite, which, even as the boulders themselves, appears to have undergone little or no change since the withdrawal of the ice, and in many places still retains the polish and scourings, imparted to it by the grinding glacier. Similarly among the thousands and thousands of glacial boulders scattered over those wonderful expanses of ice-smoothed, bare granite which one traverses on the way to Merced Lake, there is not one to be found supported by a residual pedestal. So striking is this fact after one has become acquainted with the conditions on the summit of Moraine Dome, that one cannot escape concluding that the contrast betokens a great difference in age between the glacial material lying respectively above and below the line of the great embankment. That embankment accordingly assumes a new and more definite significance; it appears to mark the culminating stage of a relatively recent ice flood, whereas the ancient-looking perched erratics on the dome attest a glacial epoch of a relatively remote date. It may have been remarked that the pedestals of the two erratics on Moraine Dome do not accord in height. That of the large lower boulder is three feet tall, while that of the smaller rock on the summit measures only about one foot. Too much significance should not be attached to this disparity, for there is good reason to believe that neither boulder has retained its exact position throughout the entire period of its lodgment on the dome. The lower one, being situated on a steep incline, no doubt has crept down hill from time to time, as its disintegrating support crumbled under the load, or as its equilibrium shifted through the flaking off of portions of its own mass. Indeed the aspect of the pedestal is such as to warrant the inference that the great erratic has not lain long in its present position. of the earlier ice flood. because of its small diameter, would soon be weathered through and through, and would either crumble down or shed the cap rock. The latter, in its new position on the surface of the dome, would then through its protective influence, proceed to generate another pedestal, and this column, in time, would probably fare like the first. Thus, it will be seen, the erratic may have occupied several low pedestals in succession. These conjectures may seem far fetched perhaps, nevertheless they possess strong elements of probability, as is indicated by certain other residual features on Moraine Dome. Scarcely 50 feet to the northeast of the small erratic on the summit, close to a dead umbrella tree that marks the highest point, is what might be taken for a dilapidated garden wall, built of dry slabs, with many chinks that let through the daylight. It is 7 feet high and 4 feet thick (see above), and over a length of about 12 feet seems entire, but the southern end appears to have tumbled down in part, and terminates in shapeless piles of slabs. The interpretation of this odd feature is not difficult. It is a portion of a thick vein or “dike” of a yellow, fine-grained igneous rock, known as aplite, that cuts vertically through the body of the dome. Aplite, it should be explained, weathers much more slowly than does granite. As the surface of the dome, therefore, was being lowered by the gradual wasting away of the granite, the dike came to stand out more and more, attaining at last its present wall-like aspect. The surrounding granite is still disintegrating and wasting away, and as a consequence the wall is even now growing imperceptibly in height. The weather, however, has also told on the aplite, and has greatly weakened the little structure. It has caused the slabs (which are remnants of surface shells that once extended over the entire crown of the dome) to crack in places, and has enlarged the partings between them to gaping holes and chinks. In fact, the greater part of the wall, as stated, has already broken down, probably under the stress of the heavy winter snows. Special interest attaches to the best preserved and highest portion of the wall, as its height affords perhaps the most trustworthy index available of the depth to which Moraine Dome has been stripped since the passage of the earlier ice flood. In the first place there is no possibility that the wall might in part have been inherited from a time antedating the earlier ice flood. An obstacle so feeble, standing at right angles to the current of the ice stream, would inevitably have been completely razed. Whoever has traveled through the High Sierra may have noted that on the great expanses of ice-polished granite characteristic of that region, all aplite dikes, the largest as well as the smallest, are shorn level with the surrounding granite. There is thus every reason to believe that the aplite dike on Moraine Dome was similarly smoothed off by the overriding glacier, and did not begin to weather out until after the culmination of the earlier ice flood. No trace of glacier polish remains on the top of the wall today (which is not surprising, as all polish of the earlier ice flood has long since vanished throughout the Yosemite region, except in those rare localities where it was fortuitously preserved under debris that has remained undisturbed by the later ice), and thus there is no guarantee that the top coincides even roughly with the original glaciated surface. Nevertheless, it seems safe to say that the wall has not been reduced much below the initial level—not as much as a foot, perhaps,—for its top is broad and flat so that superincumbent slabs (if ever there were any) could not readily have fallen from it without leaving behind a fragment. Nor are there any broken slabs about the base of the wall that appear to have been derived from the top. Again, there is a remarkable accordance in height between this aplite wall and two other walls of a similar kind, located near the southwestern end of the summit of the dome. These walls also owe their existence to the superior resisting power of aplite, but they differ from the little wall described in that the aplite veins in them are steeply inclined instead of vertical, and form slanting roofs under which masses of granite have remained preserved. They are therefore composite bodies, containing both granite and aplite, and are rather massive and irregular in shape. The upper wall is 8 feet high, about the same as the wall near the umbrella tree; the lower is almost 11 feet high, but, as it is situated on a steep south-facing slope where denudation is bound to progress more rapidly than on a level tract, one should properly expect it to be taller than either of the walls standing on the summit platform. 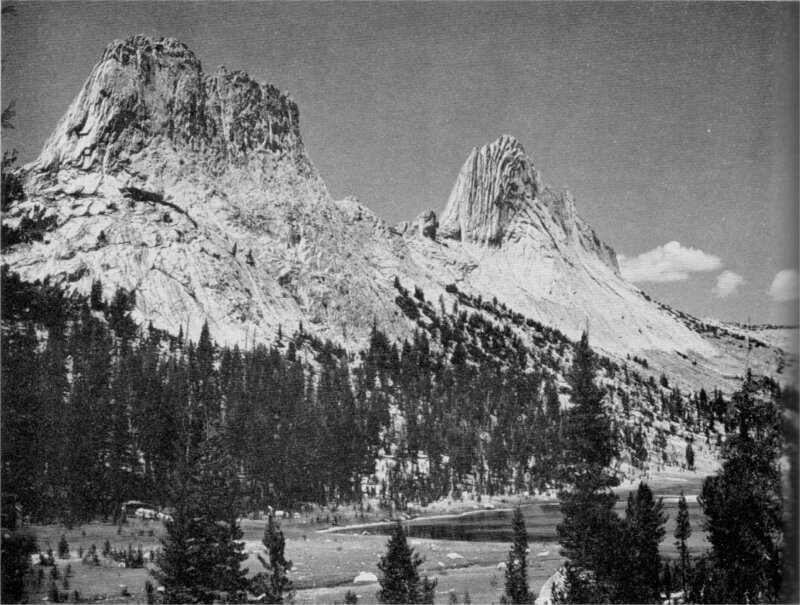 There is thus substantial agreement in the height of the three walls on Moraine Dome, although they are somewhat dissimilar in make-up and of unequal thickness, and accordingly one feels justified in accepting 8 feet as a minimum measure of the thickness of granite that has been stripped from the summit of the dome since the culmination of the earlier ice flood. Small wonder that the morainal material attesting that ice flood is so scarce on Moraine Dome! Indeed, one marvels, in the light of these evidences of wholesale weathering, that even the two erratics of Cathedral granite have remained to tell the tale. The story that Moraine Dome tells is then, briefly, a story of two glacial epochs, separated by a lengthy interval of time.2 The earlier ice flood was by far the mightier and rose to considerably higher levels than the later one, but so remote was the date of its occurrence that since then Moraine Dome and probably all similar granite heights in the Yosemite region have lost at least 8 feet in height, and the morainal material that was deposited on them has all but disappeared. On the other hand, the later ice flood culminated so recently, relatively speaking, that the scoured granite surfaces left by it appear even now essentially unchanged, and retain their polish over large areas, while the fluctuations of the declining glacier are still fully recorded in great series of moraines, many of which are strong even on exposed places such as the slopes of domes. Time was when the question at issue was whether the Yosemite had ever been visited by ice or not. Now that question is not only definitely settled, but one can speak with confidence of two separate glacial episodes. And, in view of the strong denudation that appears to have taken place since the earlier of these epochs, and has so greatly dimmed its record, one feels justified in going one step further and in asking whether there may not have been other, still earlier ice floods whose traces by now are completely effaced? It is not known with certainty why this manuscript remained unpublished, though probably it was because of the many urgent duties which Matthes as a member of the Geological Survey had to assume in the critical world situation prior to World War I. However, a technical abstract, “Moraine Dome and the Moraines of the Little Yosemite Valley,” was published in the Journal of the Washington Academy of Sciences, volume 4 (1914), pages 295-296. Also, Matthes’ interpretations were set forth in Professional Paper 160 (1930), though differently stated in that volume.—Ed. 2Later, at least three and possibly four epochs were recognized. See pp. 114, 156.—Ed.